The Marabi subculture stood in stark contrast to the values of the so-called oppressed elite of South Africa, the African middle-level population with mostly missionary educational background. They criticized the Marabi and the jazz imported at the same time from America for their proximity to crime and for their non-Christian values, in the process coming into conflict with the main mediators of music, namely music teachers. These taught their students more and more American jazz hits, which were perceived as modern. Well-known African intellectuals spoke out against the phenomenon of Marabi and promoted the choral tradition of South Africa supported by the missions. The Jazz Maniacs. Back: Zekes Searbi, Vy Nkosi, Edward Sililo. Front: Jacob Moeketsi (paino), Wilson Silgee, Solomon „Zuluboy“ Cele (Bandleader), Zakes Nkosi – c. 1940–44, photograph. unknown. Newitt, Ned: Zacks Nkosi. A Biography, <http://nednewitt.com/jazzsouthafrica /Biography.htm>, [02. 01. 2018]. There was also an ambivalent relationship with traditional music from rural areas of South Africa. Many urban people, both among the proletariat and in bourgeois circles, still had close contact with their home towns. On the one hand, both Marabi (in the form of circularity and the occasional use of traditional melodies) as well as choral pieces paid tribute to certain elements of traditional music, on the other hand both social strata also wanted to be seen as urban and modern. There was also a dilemma among the intellectual elite: emphasizing “original” folk culture was a method of anti-colonial struggle and part of the repertoire of every national movement; on the other hand, rural culture was promoted by the apartheid government from the late 1940s on to highlight alleged “racial differences”. The African intellectual bourgeoisie had also long sought to gain better opportunities within the colonial system by assimilating European culture, and therefore sought to bring European, four-part harmony into the already existing choral culture. Jazz arrived in the form of vinyl records but also through bands touring South Africa. 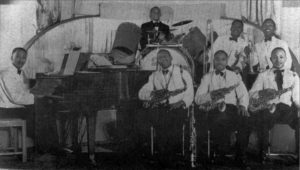 Many well-known Marabi musicians joined jazz ensembles and appeared in Shebeens and dance halls, within and without the city limits, with American pieces that had mostly been learned by ear. There were also in circulation numerous jazz arrangements of popular pieces in tonic sol-fa notation. Soon larger ensembles emerged, appearing in different venues, from concert halls and ballrooms (within and without the townships), to Shebeens and schools. A new form of entertainment established itself: the Concert and Dance evenings. 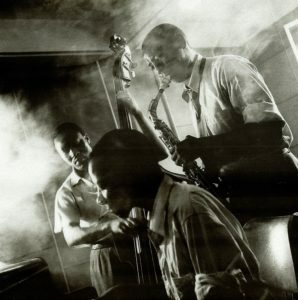 The three Jazzolomos: Jacob „Mzala“ Lepers, Sol „Beegeepee“ Klaaste, Ben “Gwingi” Mrewebi – Johannesburg 1953, Jürgen Schadeberg. Schadeberg, Jürgen: Sof’town Blues. Images from the Black ‘50s. Pinegowrie 1994, p. 105. 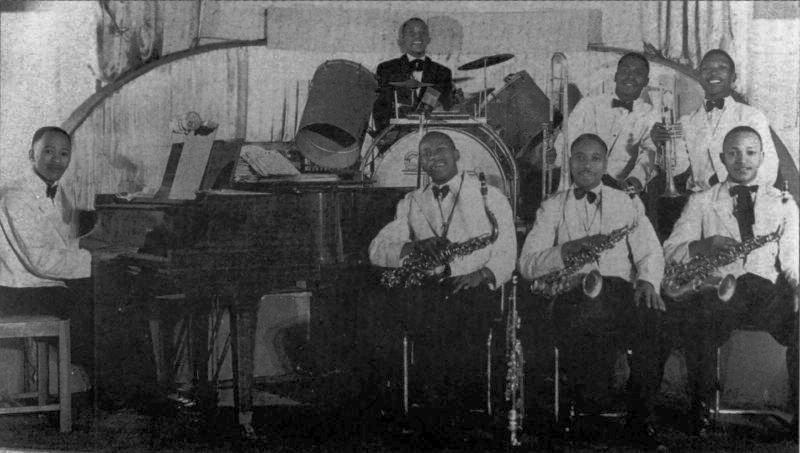 From the ‘40s onwards, through increasing enthusiasm for American cultural products and above all for the achievements of Afro-Americans in the US cultural scene, which they saw as a model for their own aspirations for equality, the bourgeois upper class became more attracted to jazz, but more to the larger ensembles and the Concert and Dance evenings than to the music of the wild Marabi parties. Many artists and ensembles set out to copy the US role models, hoping with the integration of jazz and Afro-American culture to be able to reach new heights. Comparisons between South African and American artists were made ad absurdum (the South African Fats Waller, the South African Etta James, the South African Louis Armstrong, etc.). More importantly, the urban music culture in conjunction with the United States led to the celebration of Afro-American successes as African successes and to the strengthening of equality efforts. Urban culture lived with this tension between emphasis on the roots, maintenance of traditions in a new social setting, and shift towards a cosmopolitan identity as a city dweller.